Noose pose, or Pasasana in Sanskrit, is an intermediate twist. 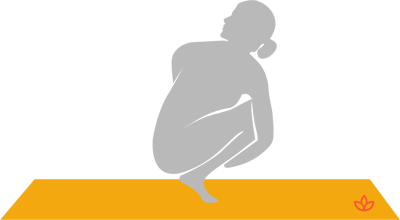 From a squatting position, the practitioner twists to the side and binds their arms around their legs. It's a deeper twist than matsyendrasana and brings even greater flexibility to the spine and shoulders. Begin in a squat with the feet together. Tuck the left upper arm outside of the right thigh and bend the elbow, reaching the forearm around the legs. Reach the right arm behind the torso. Clasp the hands. Gaze to the right. Exhale and untwist. Change sides.